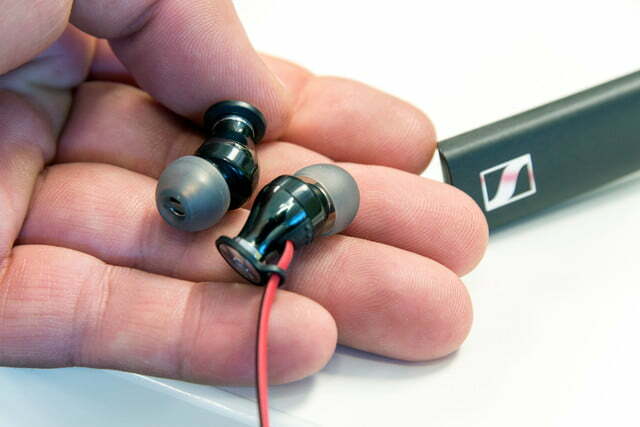 Sennheiser’s HD1 In-ear Wireless are the perfect all-day companion for discerning listeners on the go. 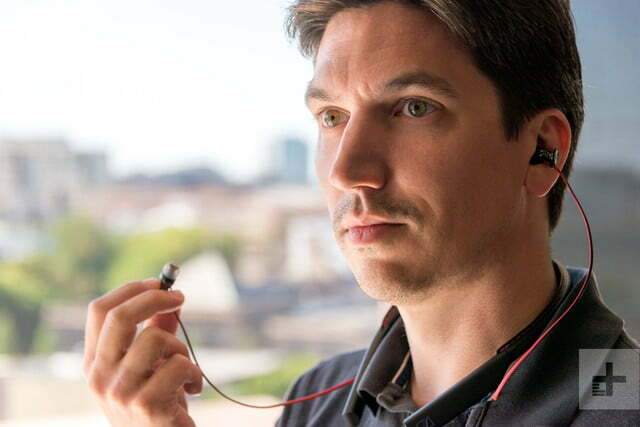 Whether you’re a constant traveler or simply an owner of the latest headphone jack-free iPhone model, there are plenty of reasons to consider a pair of wireless in-ears these days. 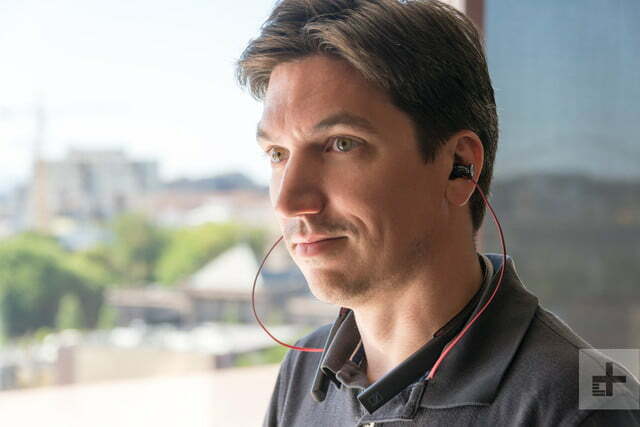 And while we still feel the world of fully-wireless earbuds has a long way to go, impressive battery life, great sound, and increasingly elegant design has led to a fantastic generation of neck-banded wireless in-ears. 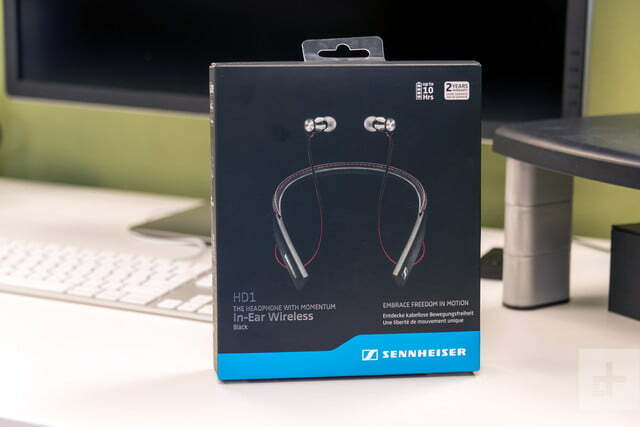 This, along with our excellent experiences with the Sennheiser brand thus far, made us all the more excited to spend time with the brands latest offering to the class for our Sennheiser HD1 wireless in-ear review. We were right to be excited. The sleek and sturdy HD-1 wireless in-ears follow up on the company’s history of quality wireless headphones like the gorgeous Momentum 2.0 Wireless and the Bose-rivalling PXC 550. The latest model not only provide an extremely vibrant sound signature, they do so in a package that’s attractive and comfortable, even after a full day of jamming. 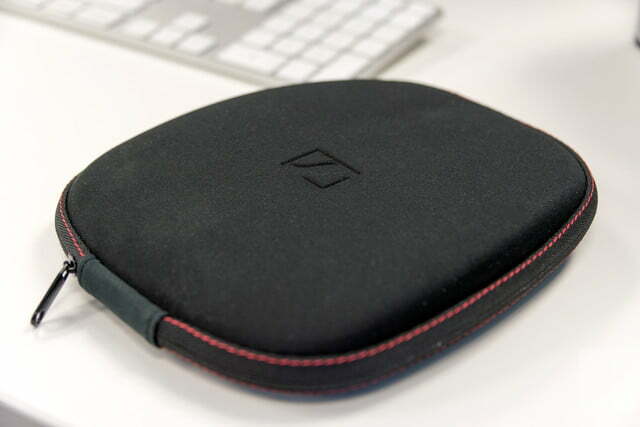 The HD1 wireless come in a simply dressed, thin black box with a molded travel case inside. Opening the case reveals a thin halo in matte black cloaked in soft leather, with dangling buds attached. 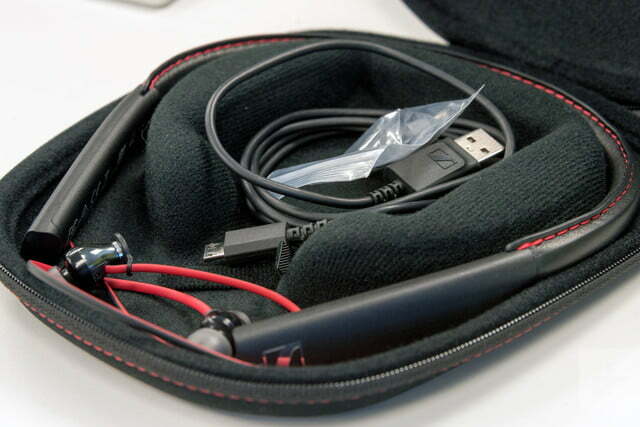 A shortlist of accessories includes a charging cable, four sets of rubber tips, and an instruction manual. The design of Sennheiser’s latest wireless in-ears is simple and minimalist, but there’s enough style here to allow them to stand out in a crowd. 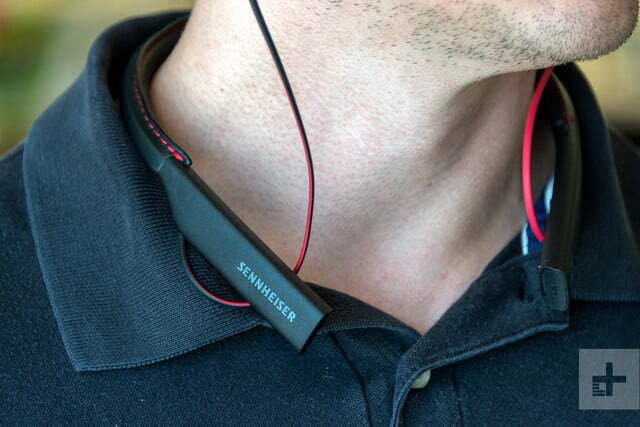 Sure, the black, leather-clad neckband screams business class, but touches like Ferrari-red stitching, red accents along the connection wires, and gleaming silver caps on the back of the buds themselves combine for enough style to turn heads. 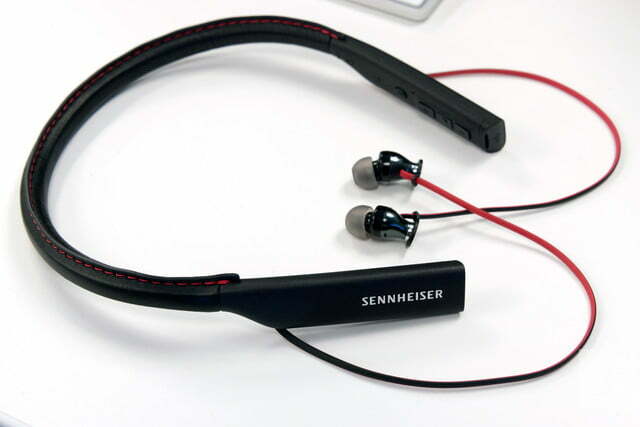 Sennheiser stuck to the tried-and-true halo design for the HD-1 in-ears, including a slim band that transitions to two larger rectangular segments on each end, short wires connecting the buds to the band, and easy-access controls. 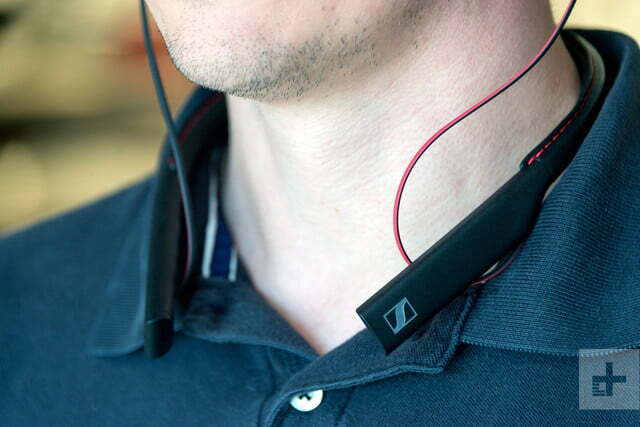 That said, while the leather looks good and feels great, we can’t help but wish Sennheiser chose a waterproof/sweat-proof coating instead, as we love using banded wireless in-ears for workouts, or out and about in the rainy Northwest. The right segment of the band contains no buttons or inputs, whereas the left side boasts a power button, an LED to indicate pairing and power status, volume control keys, and a multifunction button in the middle. The end of the left side also pops open for the micro USB charging port. Holding the volume keys for two seconds controls song skip, while the multifunction button allows you to play or pause tunes and field calls. 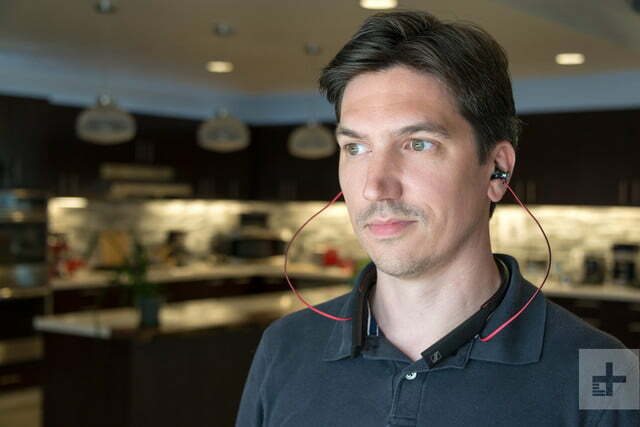 Design touches like Ferrari-red stitching and gleaming silver earbuds turn heads. 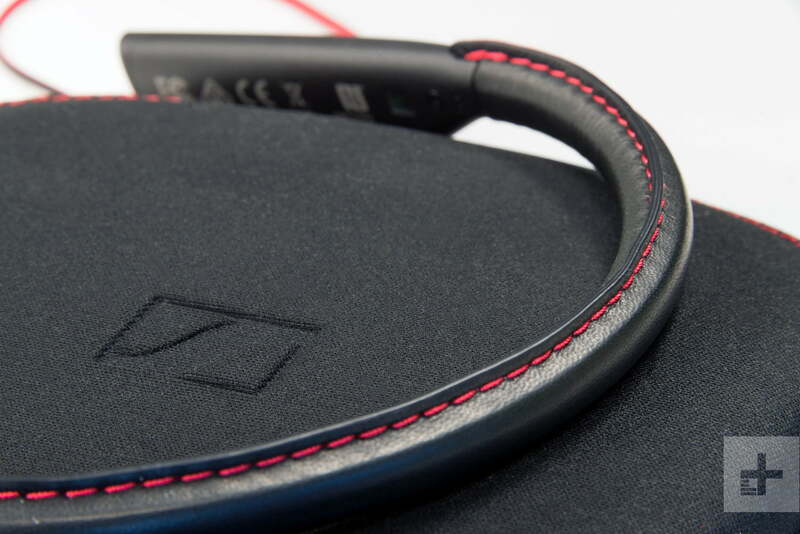 The earphones are attached at the bottom of each side, set behind the control section — a nice touch that means you won’t accidentally rip them out of your ears when you reach for the volume. 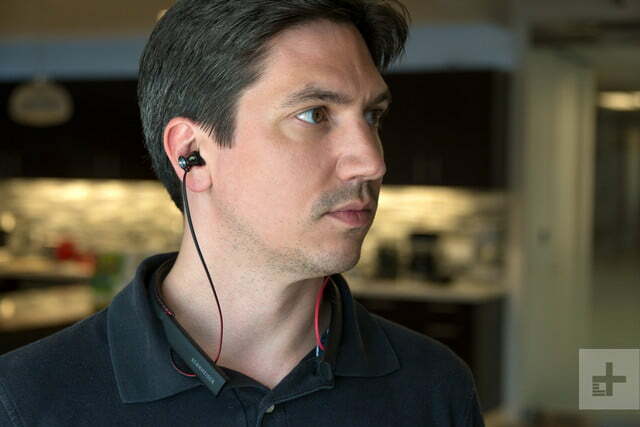 The metal earpieces are ergonomically angled, allowing for a secure fit and a stable seal. A tight fit makes for great passive noise isolation, making our open-floor office nearly silent as soon as we put them in. The same is true for public transit — we almost missed several stops because we couldn’t hear the announcements, even without music playing. 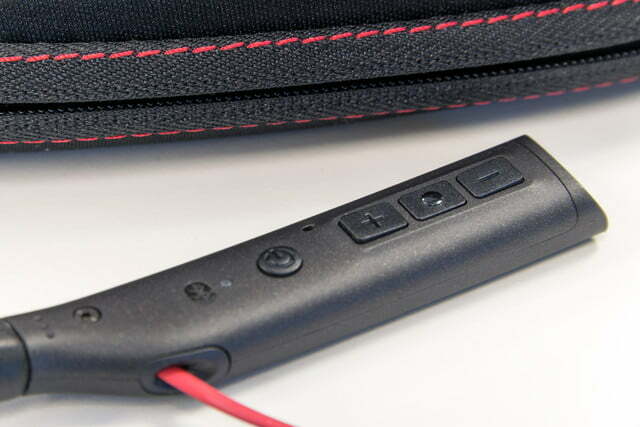 Battery life is a respectable 10 hours, and Sennheiser also include fast charging technology that will replenish the headphones fully in 1.5 hours, which comes in handy during layovers. 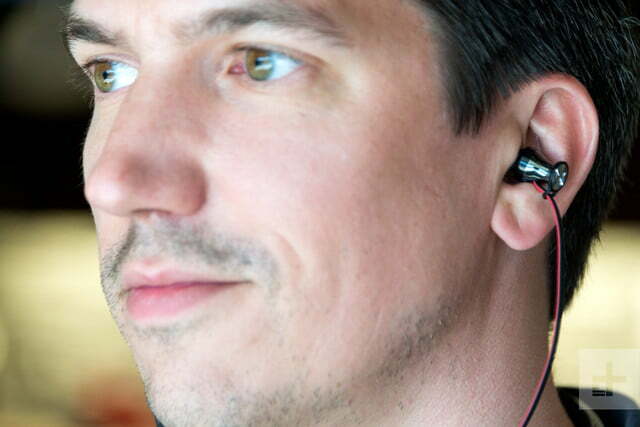 For those with Android phones, there are two ways to pair to the HD1 wireless in-ears. You can pair them manually by pressing and holding the power button until the LED flashes blue and red, and then selecting the headphones in your device’s Bluetooth menu. (This is the only method for iOS users.) 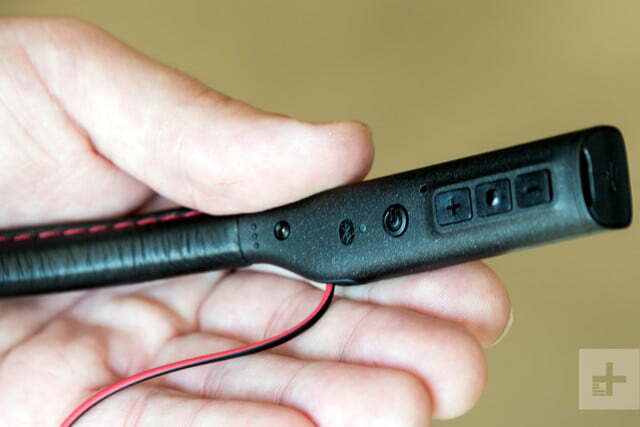 Those with NFC-supported devices can also simply hold the device to the outer right side of the earphones, then hold the power button until the LED flashes. The HD1 wireless in-ears offer a warm and revealing soundstage that makes them extremely enjoyable for long listening sessions. Where most in-ear headphones shine best in the upper-midrange and treble registers, the HD1 is most enjoyable at the low end, with kick drum and bass lines on songs like Julia Jacklin’s Small Talk rounding out the sound signature in a way we genuinely miss on many similar models. 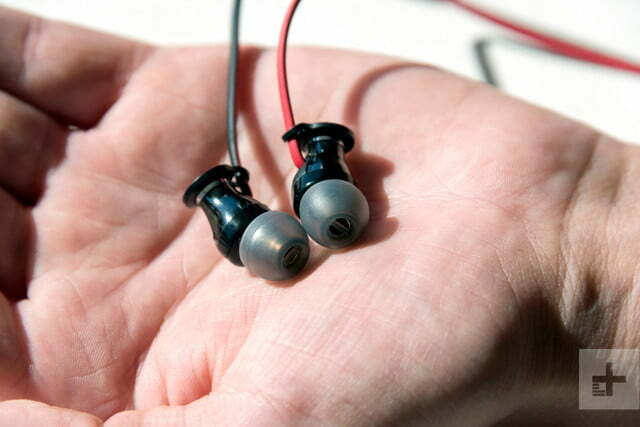 That doesn’t mean Sennheiser’s mighty wireless in-ears don’t have any shimmer up top, however. On acoustic songs like Ryan Adams’ To Be The One, the piano, harmonica, and bright stereo guitar lines are joined by a particularly focused vocal line, with just the right touch of tape noise hiding in the background up high. As with many quality in-ears, heavily stereo-mixed songs really pop on these headphones. Mac Demarco’s Cooking Up Something Good is an absolute joy, with the hard-panned guitars leaping out at you from either side of your head, tied together by drums and layered vocals in the middle. These are accurate headphones, but they aren’t tuned to be flat, warts-and-all audiophile cans, and the added touch of color makes them more fun. From hip-hop and jazz to Appalachian folk, everything on the HD1 wireless in-ears is punchy and dynamic, rather than sterile and boring. The excellent passive noise isolation also helps the overall appeal of the sound signature, providing a blank canvas over which the in-ears can paint rich sonic images. The Sennheiser HD1 wireless in-ears are an excellent option for those eyeing warm, exhilarating sound and sleek style in a hyper-portable package. Perhaps the only banded wireless in-ears we have tested that compete with the HD1 wireless in-ears for sheer audio quality in this price range are the excellent V-Moda Metallo Wireless headphones. Those headphones are geared more towards the workout crowd with a sweat-proof coating, and are a bit more revealing sonically, but they don’t offer a hard case, and sound isn’t as punchy down low. Like many other Sennheiser products, the HD-1 in-ear wireless are excellently built, and should last for many years of consistent use. In addition, the included hard case should aid in durability long term. Yes. If you are looking for fun, high-performance in-ears — and you don’t care about using them in the gym — the Sennheiser HD1 in-ear wireless are among the best on the market.